Ask fellow campers about "Catawba Falls Campground" and nearby attractions. This is an older park, built when people went camping to get away from it all. And you do! But the people were nice and we were happy to read instead of watch TV or use the computer for a day or two. Sites are small and narrow but back up to a nice creek. Only 30AMP available. We camped at Catawba Falls Campground in a Fifth Wheel. I forgot that this is a Passport America campground, so the rate shown was twice what it might have been. When checking in, the helpful manager/owner didn't mention the possible discount. The RV portion of the campground was a ring of about a dozen sites with full hookups. About half of the sites were seasonal. Each site was made of old asphalt that only extended to the dimensions of an RV; at my site, the area for hookups was dirt which turned to mud after a daily rain storm. The small store/nail salon had a few items for sale, but more was available in Old Fort, about 3 miles from the campground, located up a "holler." There was zero over-the-air TV reception, no cable service, and poor Verizon cell phone reception, but the campground wi-fi worked very well. The tightness of the steep surrounding hills meant that a satellite TV system might not work, either. This was the second time staying at this campground, and we'd likely stay again in the future as there are not many choices in the area. We camped at Catawba Falls Campground in a Travel Trailer. I am a train watching fan, and Old Fort is the location for a fascinating set of railroad loops as the trains climb from the Piedmont up into the Appalachian mountains. Andrews Geyser is a local feature and a good location to see trains climbing up. Small campground, very quiet, backed up to creek. Owners very nice. Only drawback was no cable and could not get satellite signal. WiFi was good. We would camp here again. We camped at Catawba Falls Campground in a Motorhome. Very basic campground is laid out along both sides of the Catawba River headwaters up a narrow valley about 2.5 miles out of town. A ring of a dozen sites surrounds the bath house with about half seasonals; other sites looked a little more spacious, but sites were very close to each other. Privies in other areas of the campground. Fee shown includes Passport America discount. No OTA TV reception with minimal cell service. Wi-Fi worked well. Laid back staff very friendly and easy to deal with. Camp store was not open during my 2 day stay. I was here to watch the trains and there is very limited camping in this area. I'd probably stay here again if in the area. We camped at Catawba Falls Campground in a Travel Trailer. This is a dry county, so you'll need to drive to Black Mountain for those needs. Fascinating train track climbs into the mountains starting in Old Fort; trains can be chased up the mountain. Andrews Geyser is a good train watching spot. Catawba Falls is an easy hike from the campground. Baptist conference center in Ridgecrest, about 8 miles west. This is a small family campground that we have camped in twice. Both times we were lucky enough to get a spot on the creek/river. It was very peaceful and serene and the last trip we got the spot with a wooden deck that overlooks the creek. The sites are relatively level and on gravel with shade trees on most sites. The bathhouse is small, but clean. There are two toilets and two showers in each restroom. There is a small playground for the kids and a covered picnic area for folks wanting to have a family reunion or get-together. The owners and their family live on site and have a few farm animals (ponies, chickens). The tent section is across the creek and down a little way from the RV section and they now have several yurts that they rent out. There is a small laundry room, but I did not have occasion to use it. 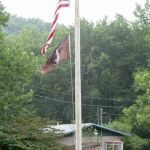 The best feature of the campground is that it is in walking distance to the trailhead to the Catawba Falls waterfall trail. Unfortunately it poured rain almost the whole time we were here this year and there was a lot of mud to wade through, so some extra gravel at the sites would have been nice. We will likely return to this campground in the future. We camped at Catawba Falls Campground in a Travel Trailer. Very nice. Family friendly and it is just a short hike to see the beautiful Falls. This small campground is immaculate in cleanliness. There is a small 'catch and release' pond for campers use. The store is well stocked and is most of the day. We camped at Catawba Falls Campground in a Tent Trailer. 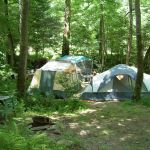 Are you affiliated with Catawba Falls Campground ?